This year has proved to be a truly tincture-filled one as I found a renewed interest in infusing different herbs in alcohol late this Spring. Getting re-aquainted with my favorite herbs 'in an alcohol setting' has been fun and has inspired a few new products. These were both started the other day, and the lavender one has already turned a gorgeous deep purple color. Below are links that will show you how to make your own tincture, but first, let's take a look at tinctures and see what they can be used for. A tincture is a concentrated herbal extract. Alcohol-based tinctures are not heated and therefore allow the full power of the herb to infuse into the alcohol. Tinctures are easy to make and require only clean equipment and quality raw materials. The time it takes to make a tincture is dependant upon which raw material you are using. Some herbs take longer than others to infuse, but in general, 2-3 weeks is enough time to create a fully infused tincture. Some will let the herbs remain in the liquid and just strain off a bit at a time as needed, but I think most prefer to strain and bottle the entire contents at once. I just finished a calendula (Pot Marigold) tincture that I let infuse for a full 8 weeks – mostly because I wanted to capture every last bit of the rich golden color of the petals. Tinctures are traditionally used as herbal medicines and taken internally. This can be done by adding the tincture to a tea or even taking it straight. The most common way of taking an herbal tincture is to add the proper dose to a glass of water or juice and drink the entire contents. IMPORTANT: The dose will vary, depending on the tincture! A very general rule for internal use of tincture is: 14 drops for every 25 kilos (approx 55 pounds) of body weight. Because I just finished a calendula tincture, I've done a bit of targeted research on this particular plant. Calendula tincture is referred to as 'liquid sun for the woes of winter', helping to stimulate circulation and offering antibacterial help for colds and sore throat. Living in Scandinavia, the winters here can get pretty dark and gloomy. My calendula tincture is going to be tested this coming winter season – a few drops of 'liquid sun' will be added to my morning tea to see if it is at all effective at keeping those wintry Nordic blues away. Tinctures can also be added to finished products such as a basic cream or lotion to create a targeted use product. 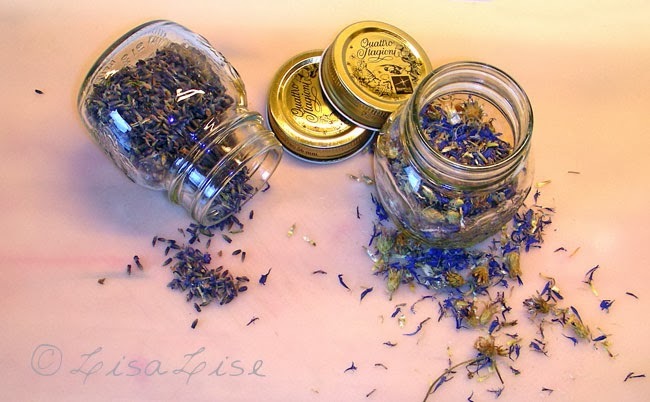 Make a skin soothing cream by adding 1-2 ml of lavender or chamomile tincture to 100 ml of a basic, unscented cream. As with internal use, be mindful of the dosage with external use of tinctures. A general rule is to keep the tincture at 1-2% of a product. Again - it is dependant upon which herb is used and which product the tincture is added to. In a skin tonic, a tincture will contribute a bit of 'herbal oomph' to the mix. I've been trying different tinctures in my skin tonics, mists, and skin drenches over the past months with so much success that I have started passing samples to my regular testers. Next time, Im going to show you how to make a soothing skin spray with calendula tincture. Are you ready to try making a tincture? It's easy peasy! Check the links below. It's me again. I'd to know what is your opinion in making tinctures out of tea leaves? For example, rooibos tea tincture or green tea tincture. Is it worth a try? I am currently still collecting more information on herbs suitable for making tincture. 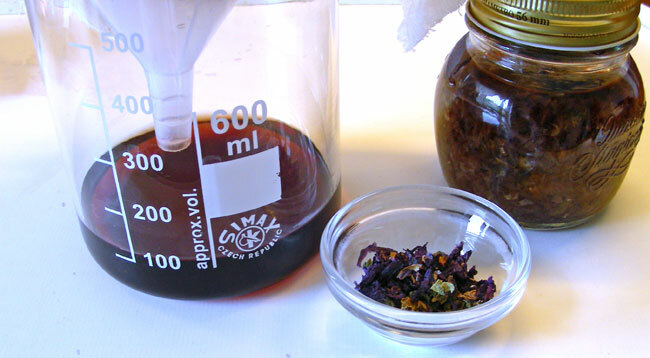 I'm interested in making lavender, rose and calendula tinctures, but I thought trying it out with tea leaves is a good idea to get the antioxidant benefits of tea :) What do you think? Hi Zan - I love your idea of doing a tincture with tea. Rooibos is on my to-do list. Let me know how you get on with it and which tea you decide to use! I have extreme muscle tension in my shoulders and neck. I buy the Wish Garden brand herbal blend called Serious Relax. It is not super effective but I have thought about whether it might work externally. Could it simply be added to coconut oil or does it have to be a lotion. would it work to combine it with sesame oil, which is supposed to be calming? Or is complicating the mix, not a good idea. Hi Shari - I don't see why you couldn't add some of your tincture to a cream or indeed coconut oil. As the Wishgarden product contains both water (and glycerin), you'll want to mix portions for immediate use if you want to avoid having to add a preservative to your mixture. Best of luck with it! So if I weigh 170 lb I when take 45 drops? HI Anon - it really depends on which tincture you are using. The guideline above is a very general rule. My best advice: start with the lower end of dosage. I've just started making tinctures for external use. I've tinctured wild roses in denatured alcohol but the smell of the alcohol is very strong. I'm looking to add 1-2% of the tincture to a body butter formula but I'm worried about the smell over powering. Should I evaporate the alcohol and use the absolute left over? Hi Unknown -When you want to add a small percentage you might want to just try and make a small batch before deciding whether you can use the tincture as is or if you want to process further. Best of luck with it! Hi Lisa. Is it okay to use an oat tincture as part of a lip balm formula? HI Anon - An oil-soluble oat extract should indeed be doable. You might even consider using oat oil?